Most of the world's plant and animal species could be named before they go extinct, say researchers. Writing in the journal Science, the researchers said it could be achieved this century. This is largely a result of an increase in taxonomists - the people who describe species new to science. The scientists acknowledge that although there is an extinction crisis, they say the rates are lower than previously thought. Discovering and naming the world's species is critical for their conservation and can be done with only a modest increase in effort, the researchers stated. But they also recognised it will be difficult to maintain a high rate of discovery as it becomes harder to find rare species. Previous overestimates of the number of species - some as high as 100 million, led some in the scientific community to believe that it would be impossible to name all the world's species before they go extinct. Naming a species gives formal recognition to its existence, making conservation easier, said lead author, Associate Professor Dr Mark Costello, from The University of Auckland. "We believe that with just a modest increase in effort in taxonomy and conservation, most species could be discovered and protected from extinction." As more information on taxonomy is available to the public via the internet, amateur as well as professional taxonomists are increasing, especially in regions such as Asia and South America, which are rich in biodiversity. "We've discovered three times more people now naming species than there were ever before. We're in the golden age of taxonomy," added Dr Costello. He hopes that this increase will continue, and that the public become more involved. There are currently around around 1.5 million species which have been named. Dr Costello and his colleagues estimate the total number species on Earth ranges from two to eight million. "Overestimates of the number of species on Earth are self-defeating because they can make attempts to discover and conserve biodiversity appear to be hopeless," said Dr Costello. Jean-Christophe Vie, deputy director of the International Union for Conservation of Nature species programme, disagrees with the review's conclusion that "species are more likely to be described than become extinct". "Extinction is usually underestimated. 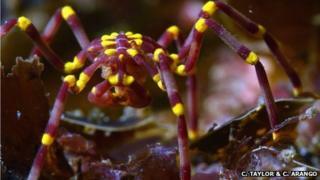 It's more important to fight extinction than to describe or catalogue all species," he said. "We can protect species even if we don't know all of them. I have no doubt we can catalogue all of life, and it would be useful, but we don't have the luxury of time. "I am worried by the message implying that to conserve species you need to know everything about them. You can do a lot of protection even in the absence of knowledge." To reduce the time it takes to name the world's species, Dr Costello and colleagues recommend more taxonomists to be employed, increased financial support and international coordination in the scientific community to share expertise. Professor Georgina Mace, from the Centre for Population Biology at Imperial College London, welcomed the analysis but also questioned whether we really need to know the names of all species. "Its excellent news, that taxonomic expertise is moving very effectively to tropical countries where most of the biodiversity on Earth is," she said. She added that with sensible sampling, conservationists could prioritise groups of species that are disappearing in the places most under threat. "Once you've done that you can put in place conservation actions that will benefit everything there, whether named or not." "It is part of our cultural responsibility to have looked at every single species on Earth, but because it can be difficult to do - particularly the last few percent - we need to be quite strategic about the effort put into discovering, describing, monitoring and conserving." The levels of investment needed to name all the species is very modest, in global terms, said Professor Ken Norris, director of centre for Agri-Environmental research at Reading University. He added that many species play important functional roles in the way Earth works and the life support systems they provide. "If we lose them, important functions of those systems - like purifying water, providing fertile soils and clean air - might be damaged without us realising what we've lost," Prof Norris explained. "Extinction isn't just about losing part of Earth's evolutionary history, it might also involve fundamental changes in the Earth's ecosystems that may have detrimental effects on mankind."